With its ever-changing landscape, the rich history of New York can feel lost to the ages. On any given street corner, the various homes, storefronts, landmarks and empty lots have seen quite a bit in their time. Now, we can see it too. The New York Public Library’s "OldNYC" allows users to interact with the visual past of the city’s many streets. 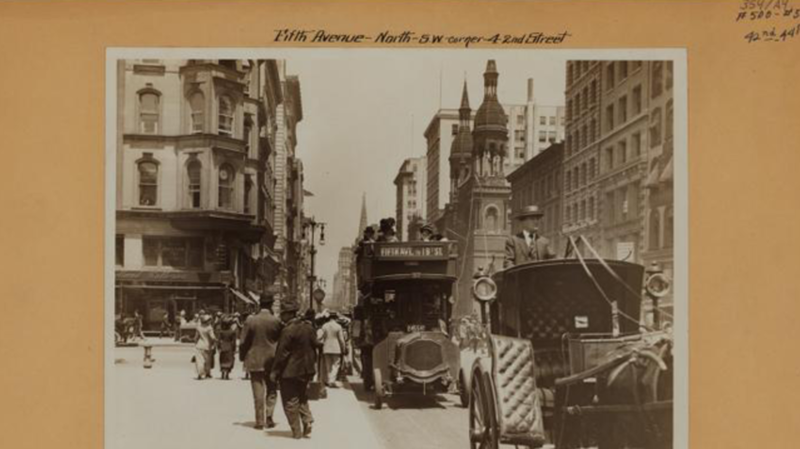 The photos on the map are from its Photographic Views of New York City, 1870s-1970s collection, much of which is the work of Percy Loomis Sperr, a Staten Island-based photographer who documented the city from the late 1920s to the early 1940s. With the interactive map, you can hop from Midtown to Governors Island and then up to the Bronx and down to Coney Island. The best stuff, however, might be the shots of relatively unremarkable thoroughfares. I pulled up my street in Greenpoint, Brooklyn and found that in 1935 the corner was home to a lovely-looking Roman Catholic Church. Now, 80 years later, a library occupies the space—just another piece of New York history that might someday seem remarkable to a future Yankee.